(From Press Release) –Davis Legacy Soccer Club (DLSC) today named its 56-acre soccer complex the Tsakopoulos Family Soccer Complex, in recognition and appreciation of Angelo K. and Sofia Tsakopoulos and AKT Investments Inc. (“AKT”) for donating the land that has made it possible for the club to serve over 750 youth athletes, their parents, members of the community and thousands of visiting players each year. Since opening in 1990, DLSC has become one of the premier youth soccer complexes in the nation, fulfilling its mission to create an environment for youth players to develop skills and love of the game, and to build a College Development Program. The Club’s local economic impact exceeds $3 million annually. 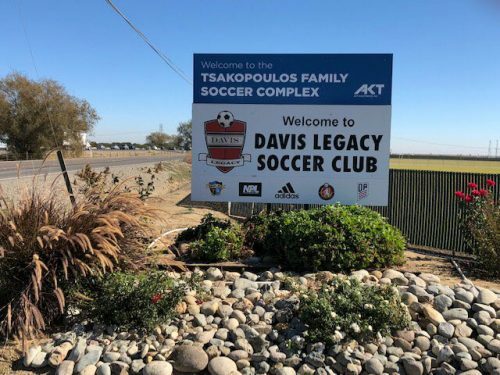 Davis Legacy Soccer Club offers programs for athletes from five to 23 years of age from throughout the Greater Sacramento Region, and as far away a Sonoma, Chico and the Central Valley. Its robust scholarship program assists families who cannot afford Club dues and has successfully trained young athletes who have played on national teams around the world, and professionally in the United States and overseas. DLSC supports the aspirations of students to play in college – from Division 3 to Division 1 – through mentoring, scholarship programs, and relationships with college coaches.